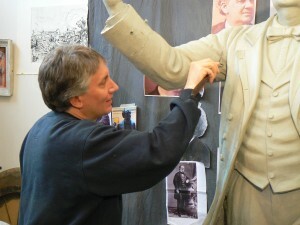 The Bethel Historical Society and sculptor David Gesualdi are celebrating the 200th anniversary of P.T. 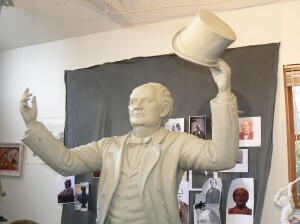 Barnum’s birth year with a new statue that will be dedicated in September. 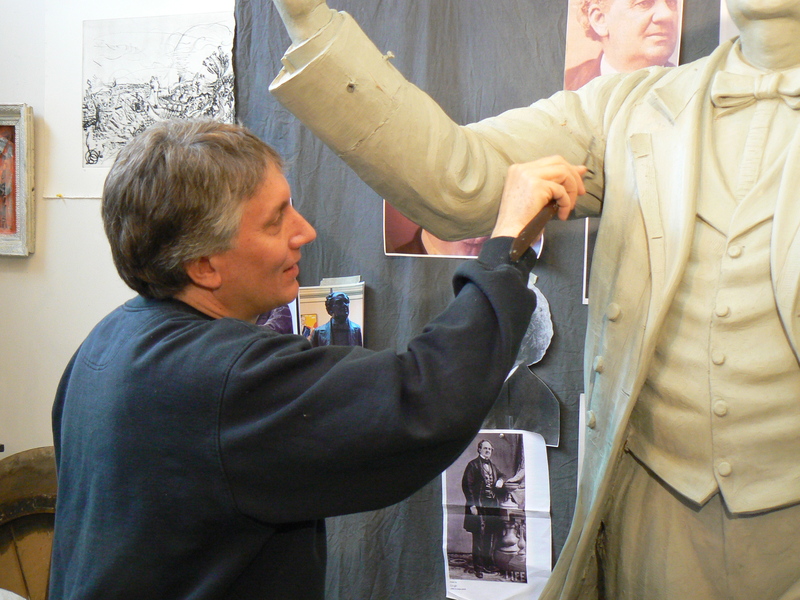 Dave Gesualdi, who was also responsible for Bethel’s Veterans’ Monument, estimates he has four to five weeks’ worth of work before the 600-pound clay sculpture that dominates his Bethel studio is sent to the foundry. 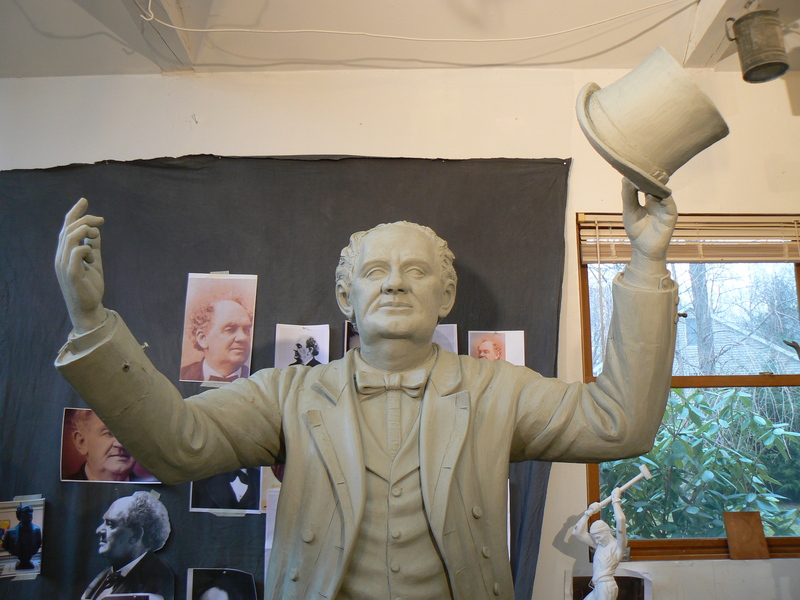 The statue, scheduled to be dedicated on Sept. 25 as part of a celebration of Barnum’s life that will include a parade, depicts the noted showman, political and social leader waving a top hat and striding forward. “I have to age him and add a lot of the character details like his eyeballs, but most of the structure is in place,” Dave says. After being approached by the Historical Society early last year, Dave began sketching preliminary designs for the statue. Three models were displayed in the local library, and residents voted on the winning design. The top hat, while being historically accurate, also pays tribute to Bethel’s former role as a hat manufacturing center. To capture Barnum’s appearance, the walls of Dave’s studio are decorated with contemporary photos. He also studied the 1893 Barnum monument in Bridgeport’s Seaside Park, which the showman posed for in his later years. Highlights of that visit can be seen in a YouTube video. 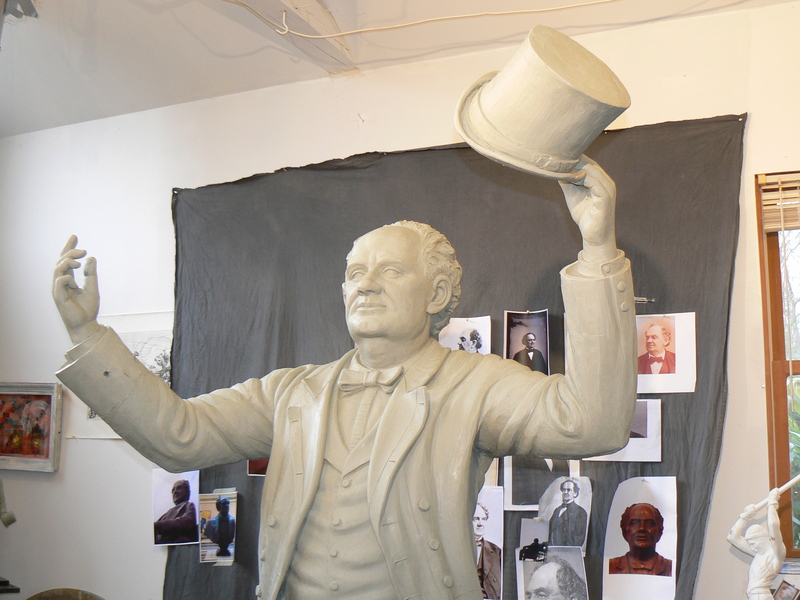 The Barnum statue will be cast at the Polich Tallix Fine Art Foundry in Rock Tavern, N.Y., using the lost-wax casting method. Under this process, the clay statue will be coated with rubber to create a mold. 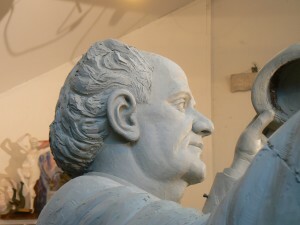 The rubber mold will be used to form a wax version of the statue that will be dipped several times in a ceramic mixture, and that mixture will be hardened to create another mold. 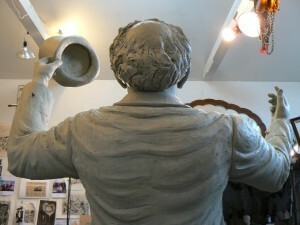 The ceramic mold will be filled with the molten bronze that will yield the final statue. “I’ll be working on the final details with the wax version, and smoothing things out with sharp tools and hot tools,” Dave says. 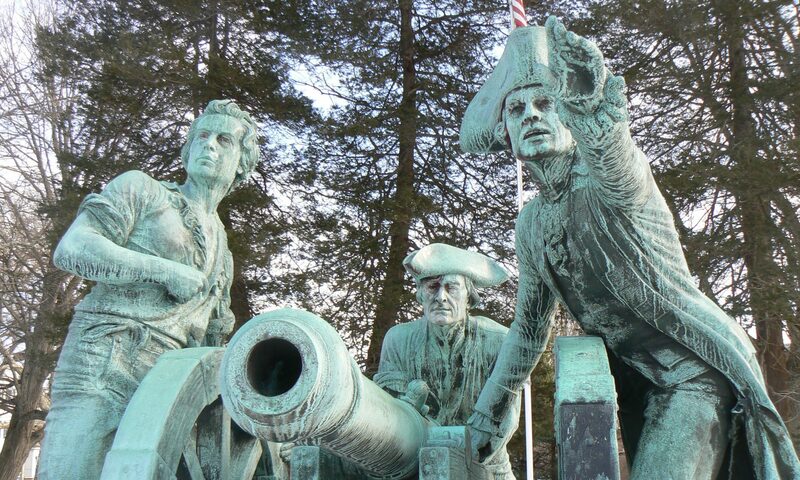 A number of the statue’s design considerations are based on its being displayed outdoors. 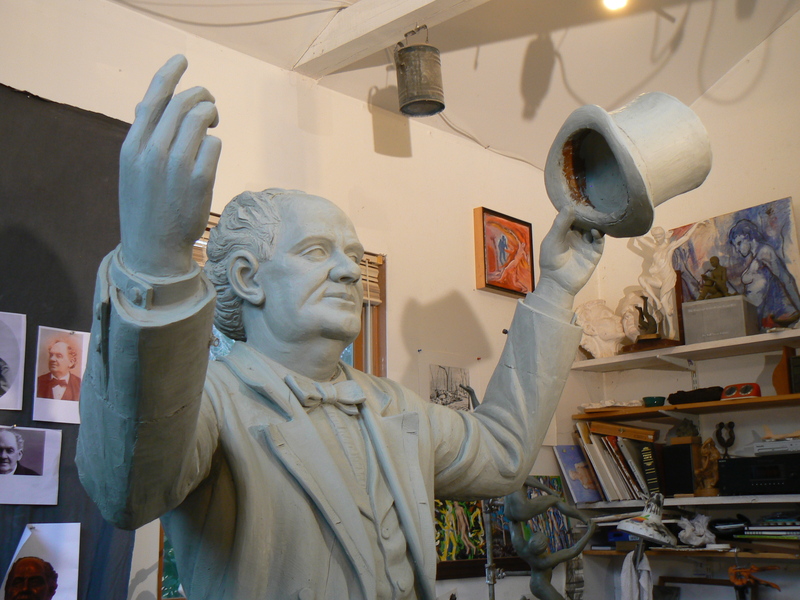 For instance, the depth of the interior of Barnum’s top hat is being limited to prevent birds or bees from nesting inside, and Dave tried to reduce places where rainwater could collect on the statue. Similarly, elements such as Barnum’s collar and bow tie were made thicker than life-size so they’ll stand out to a viewer looking up at the statue, which will be mounted on a four-foot base. 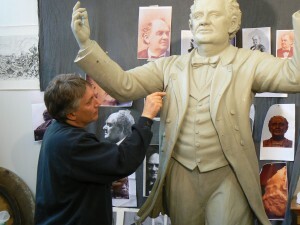 Independent filmmaker Corey Boutilier is documenting the creation of the Barnum statue and Barnum’s life in a film, P.T. 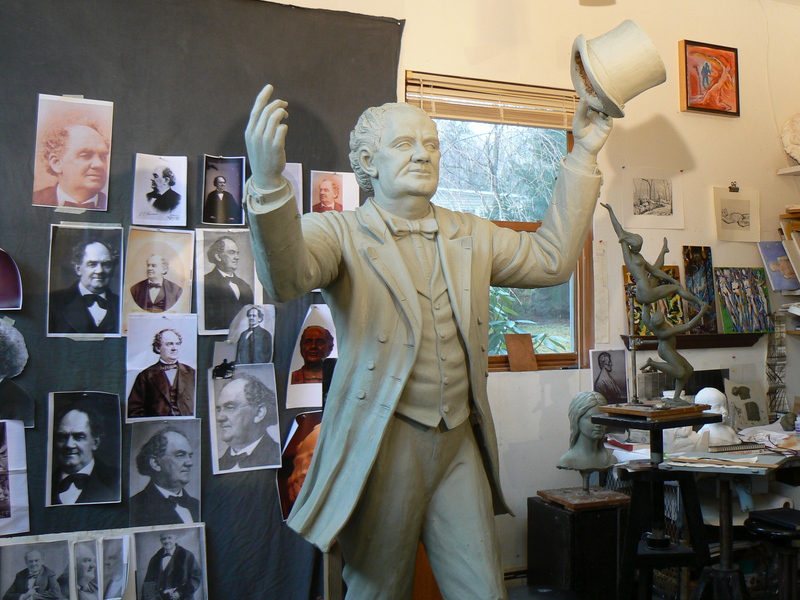 Barnum The Lost Legend, scheduled for release in November. 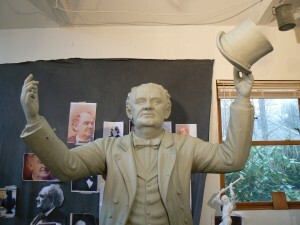 The statue’s progress is also being chronicled on a Facebook page available at http://www.facebook.com/ptbarnum.